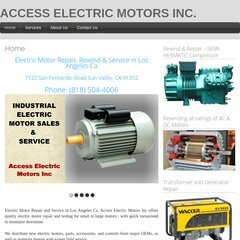 www.Accesselectricmotors.com - Access Electric Motors Inc. Topics: About Us, Contact Us, and Pictures. dns01.gpn.register.com, dns02.gpn.register.com, and dns03.gpn.register.com are some of its 5 Nameservers. Icon Developments (Utah, Lindon) is the location of the Resin/3 server. Its IP Number is 192.41.9.23.